Heralded as a pioneer of flavor-first, plant-forward cooking, chef Steven Petusevsky is driven by the desire to make healthier cuisine more craveable, creative, accessible, and understood. Dedicated to transforming the way people shop and eat, his early culinary studies took him across the globe in search of innovative and authentic cooking techniques. As a result, Steve was one of the first chefs to bring quinoa directly from Peru during a time when people still struggled to pronounce it, and to raise kale’s profile from uninspired seafood garnish to delicious star of the show. Fast forward to today. 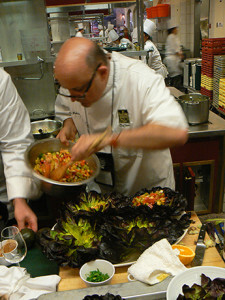 Steve’s deep understanding of food trends and expertise in modern, plant-centric, Mediterranean-inspired cuisine continues to be sought out by leading retail stores, restaurant chains and institutions, including Google, Lettuce Entertain You, Mariano’s, Native Foods, UCLA and many others. As an innovator and creator of food service programs, Steve is an in-demand outside resource, renowned for bringing a fresh perspective and global eye to help an ever-growing list of clients craft profitable, unique food service programs. As a member of the Menus of Change Advisory Board for the Culinary Institute of America (CIA) and co-chair of the CIA’s Appetites & Innovation initiative, Steve heads-up a national leadership collaborative dedicated to advancing culinary excellence, health and wellness, sustainability, and innovation culture in retail food service.